CAMP Festival 2014 – a brand new creative technology, art and design event in Calgary – needed help in its inaugural year to create a title sequence that would introduce all speakers of the event. As title sequences go, this was a cool opportunity to be creative by contributing to something that hasn’t been done in Calgary before – bringing local and international digital creatives together and getting them excited, connected, and inspired. The goal was to give CAMP a strong presence on the screen, and create a unique atmosphere that catalyzes the audience’s imagination and sets their expectations on fire. Literally. Of course we couldn’t do it alone, so we enlisted our friends at DDG to give us a hand. We always tried to find an excuse to collaborate on a project together and CAMP 2014 Titles seemed like a good chance to do that. We had a tight timeframe to work with so we started with ideation right away. 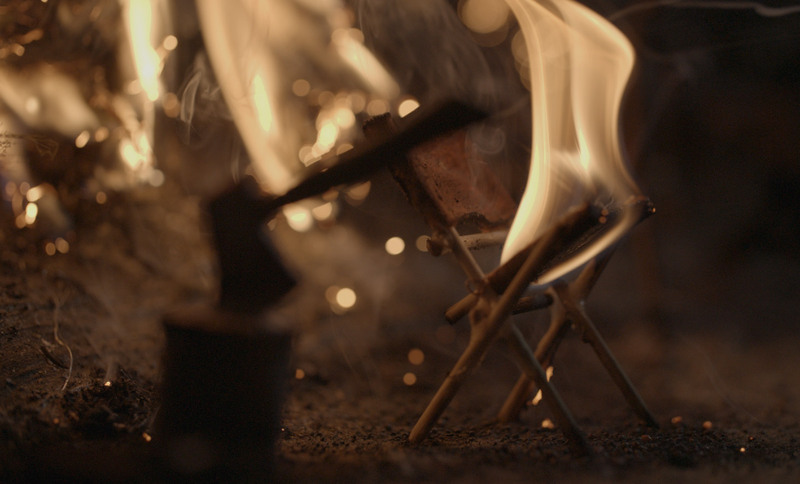 During brainstorming sessions leading up to the project things like miniature sets, slow motion and fire seemed to appeal to everyone. This is when we also enlisted Bleeding Art Industries because their expertise in fabrication and special effects would be essential to execute the concept properly. The concept was to portray a spark or a flame (a metaphor for an idea or inspiration) as a creative force rather than a destructive one, and show that it can build, or re-birth things as it sweeps through the landscape. This could hopefully be achieved by capturing a variety of footage of a burning campfire set and then editing it into a sequence in reverse motion, beginning with the charred, coal covered ground, and ending with a lush and peaceful campsite by the moonlight. Once the concept was firmed up, we went on to source references, create mood boards and a detailed storyboard. Finally, it was time for the talented team at Bleeding Art to create the miniature camp site including mountains, trees, a bonfire and a tiny tent settled nicely in solitude next to a river. Miniature props like hiking pants, socks, a lounge chair, tent, flagpole, axe, chopped wood, towel and even clothing pins were produced for our burning and your viewing pleasures. 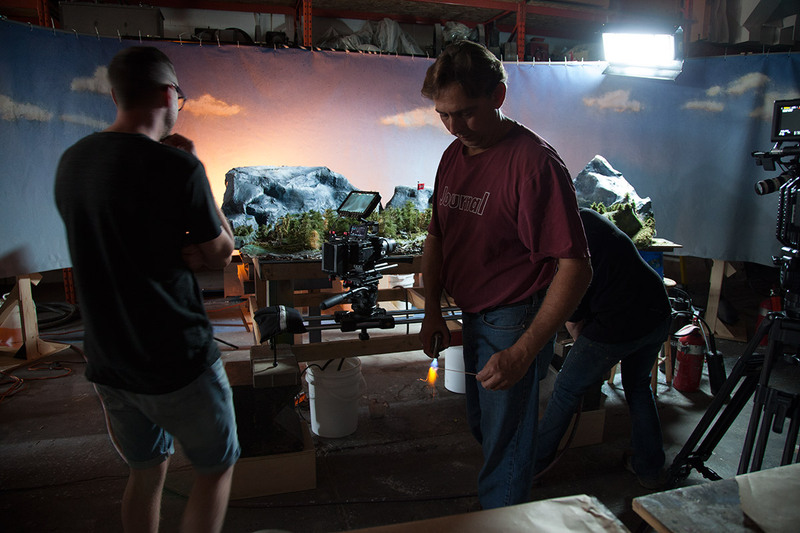 We mobilized all of our key players and were able to shoot the entire sequence in one day. 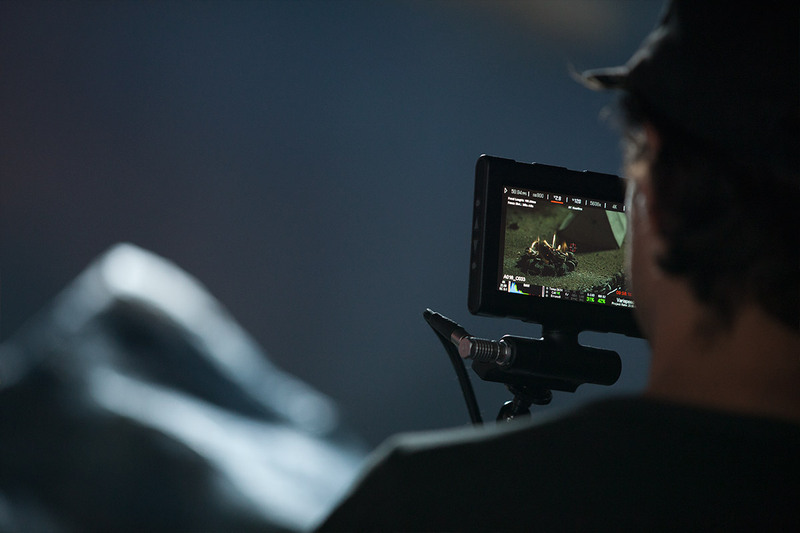 Plenty of dry ice and loads of gun powder was used on set to create special effects fit to be captured by the RED camera and played back in slow motion. As you can surely imagine, one of the biggest challenges was placing the cameras to capture the set burning. We would only get one chance at this, so it was imperative that the cameras were placed in safe zones (far enough away that nothing would melt) but could get close enough for some detailed pans. The heat and smoke produced by these materials burning isn’t healthy for the lungs, so smoke respirators were essential for all the crew members on set. Along with the heat, respirators can become a hindrance on long shooting days but make everyone look so cool! The only miniature item that was left nearly intact was a tiny log with an axe. We kept it as a souvenir. After a long day of shooting a variety of sets from different angles, we wrapped with an extensive amount of footage. It was a cue to begin the editing and post-production process. This was DDG’s territory. Sound design plays an integral role in creating the right pace and ambiance, so after we got our hands on a rough cut from DDG, we sent it out to our sound designer Drastic Studio. 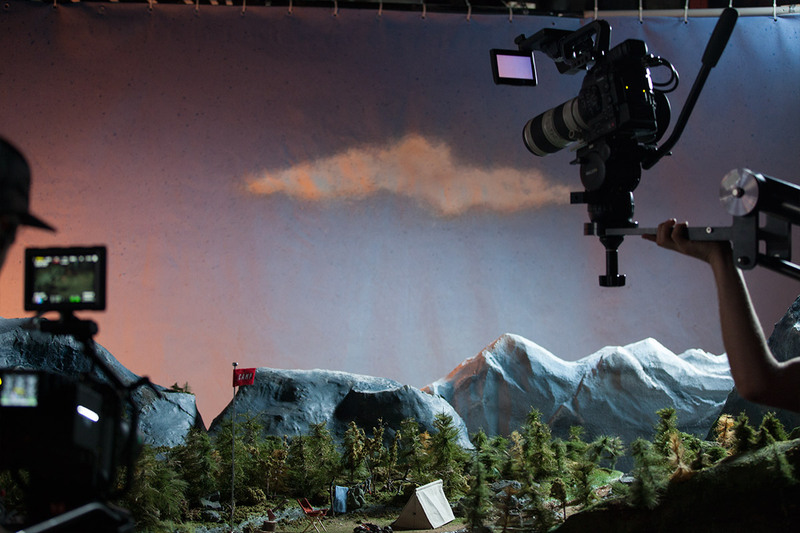 We wanted it to have a digital texture and feel, to play on the theme of digital creativity which is what CAMP Festival is about, but we didn’t want it to overwhelm the very tangible miniature environment that had so much depth on screen. The editors and sound designer worked together sharing assets as often as possible, usually late into the nights, eating up ginormous amounts of bandwidth to make sure the composed sounds would fit with the scenes and we could deliver on the due date. Collaboration is amazing when you have the right team members both locally and internationally as in our case. The reveal at CAMP Festival was also nothing short of amazing – showing it on a 9×12 foot screen in front of an audience of 335 people from the industry was rewarding. There was so much excellent footage that we were even able to decorate one of the parties on the day of a freak snowfall, with some additional burning reel. As some icing on the cake, our efforts were awarded with an Anvil award for best videography. © 2019 Wild Forest Inc. All rights reserved.